ACT MP, David Garrett is again reacting to criticism of his three strikes bill (when it might be a better course of action to just ignore detractors). Garrett has now issued a release saying the claims are 'completely laughable'. He would know about where the death penalty is still common having researched and written an entire book arguing that New Zealand should re-instate the death penalty. 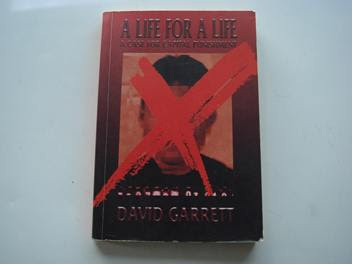 New Zealand, of course, wouldn't be a 'barbaric regime' for imposing the death penalty because it would only apply to murderers, by Mr Garrett's prescription. We would still be a liberal and progressive nation. Come to think of it, Mr Garrett is normally heard denigrating 'liberal' and 'progressive' thinking. Perhaps he has had some sort of conversion. I hope so. John Boscawen is the best person I can think of to go head to head with Sue Bradford over amendment of the anti-smacking law. I spent a few hours with John outside a Labour conference last year protesting against the EFA. The way he engaged with Labour MPs and the public, with unfailing politeness and sincerity and passion was impressive. Let's hope his bill is pulled out of the ballot at soonest opportunity. The Principals Federation has called on the Government to reject boot camps. The call follows expert advice given at this week's two-day behaviour summit in Wellington. Youth Affairs Minister Paula Bennett agreed "boot camps haven't worked in the past which is why we're not doing them". Forty of the most serious repeat offenders each year will undergo three months' military training as part of 18 months' intensive supervision under the plans. Social Development Minister Paula Bennett said the boot camps would follow six-month residential programmes and be followed by a further nine months' supervision. National promised the boot camps before the election, but it was not revealed till yesterday that they would be run by the army. The Defence Force is in discussions with the Social Development Ministry on how the camps will run. Perhaps the Youth Affairs Minister has a different brief to the Social Development Minister. It will be interesting to see how 'they' reconcile the two. What is going on with 3 strikes? As I understand it the 'added crimes' to the three strikes law will only qualify as a strike if the perpetrator is sentenced to prison for 5 or more years for that particular offence. However, looking at the bill, the crimes added that qualify as a 'serious violent offence' might not constitute violence. Let's take one; sexual connection with dependent family member under 18 years. A consensual affair between a 17 year-old step daughter and mother's partner? Does anybody really believe that constitutes serious violence? There are others like 'kidnapping'. With the prolificity of custody battles today, kidnapping is more common. Again it doesn't necessarily involve violence. So why were they added? Mr Power said the list was designed to fulfil National's own parole policy, which would deny parole to those convicted of a violent offence punishable by five years or more if they had committed a similar offence before. Of course a judge can take circumstances into account and sentence the offender to less than 5 years thereby nullifying their qualification as strikes. Perhaps that is why ACT accepted their inclusion. If indeed Simon Power is telling the truth about that. In related news, I note that earlier this month Hungary voted against three strikes legislation. Parliament on Monday refused to put on its agenda the Fidesz "three strikes and you're out" motion aimed at tightening the penal code. MPs voted with 199 dissensions, 166 affirmative votes and three abstentions. Professor David Fergusson, head of the Christchurch Health and Development study, is urging greater parenting education. The Government is being urged to ... expand a scheme providing parenting courses for parents of bad kids. This will dovetail nicely with Mr Key's comments yesterday about National's big idea for welfare reform, 'mutual obligation'. And it will mollify National voters quite nicely. But it's not OK for parents to be on welfare. Not merely by virtue of being parents. Left liberals don't like that statement. That's why they spent decades successfully attempting to de-stigmatise being on a benefit. Now the centrist conservatives want to jump on the same band wagon. How many people are on the DPB? Answer - 100,000. Do you want to 'Lock it in', John? John Key, as did the PM before him, gives one hour of his time to engage directly with NewstalkZB Wellington listeners each month. Good on him for that. In response to a question about the DPB, young mothers and child abuse, John Key replied that it is "factually correct" that some young girls, "who lack confidence in a lot of ways and see a pathway forward to have a baby to some random guy because the state will pay them to do that". His answer to that problem is 'mutual obligation'. That is, demanding that these mothers get better parenting skills and lift their capacity to raise their children better. Which prompted me to call in and ask my own questions. I said that clearly he understood the problem of young mothers and at-risk children but with respect I didn't think mutual obligation would work as some of these girls have had years of skipping school, being involved in petty crime, etc. In light of that I wanted to put two questions. A broad question for him and a more specific one for National. First, what was wrong with adoption, which would give many of today's at-risk children a better shot and second, why won't National cap the number of children a woman can have on the DPB? 1/ He was familiar with the adoption statistics, seemed regretful that there are so many couples who would love to have the opportunity to adopt and can't; understood the change in attitude to adoption driven by "academics and others" but didn't think that attitude was going to change any time soon (didn't give his own personal view). 2/ He voiced the usual concern about more children in poverty if a cap was applied but then said Bill Clinton had done exactly that in the US and by all accounts it was a successful policy. Then he asked himself a question. In terms of reducing the number of people abusing the system, would it stop it? Yes. It would play a part in that. So, as people who abuse or misuse welfare are counting on, mouths to feed will continue to win the day. If I had a further opportunity to respond I would have pointed out that if the incentive to have a baby or additional babies was removed the objection he put up may very well cease to exist. You see the discussion about DPB reform always grinds to a halt when someone asks, but what will happen to the vulnerable children? What vulnerable children? The few that are still produced, despite their mother knowing she couldn't get onto a lifetime of income support with a home of her own? Rather than thousands every year there would be a few hundred whose mothers, by virtue of opting to go ahead without the DPB, would make the most motivated and emotionally well-equipped parents. It risks sending a very confused message. If three of them are voting one way and two the other, what does ACT actually think or stand for? Update; Here is the link (22:54). His exact words were "...what is ACT's position actually on something." A number of US state governors are turning down federal money, the 'stimulus' package for enhanced unemployment benefits. They do not want to expand entitlements and risk pushing up local taxes when the federal money dries up. Sound thinking. Texas is one. Their unemployment rate is only 6.4 percent, well below the US average. "The governor's main message is Texans who hire Texans drive our state's economic engine, and the last thing we need to do is burden them with higher taxes." They can see exactly how further government intervention will damage their economy. Louisiana, Alabama and Mississippi have already rejected the bail out money. One silver lining on this dark cloud of recession is that at some future point we will be able to see which states have taken the right road. I will put my money on those who refuse to expand welfare. Portugal is predominantly Roman Catholic, has a population of 10 million and ranks 39th in international GDP per capita stakes. In 2001 Portugal changed the law to allow people to have in their possession up to ten days supply of any drug, including cocaine and heroin, and escape a prison sentence. Under the decriminalisation model employed, regional authorities, made up of health professionals and social workers, focus on 'dissuasion' of drug use. If police discover people in possession of the prescribed amount or less they are referred to one of these boards to appear within 72 hours. According to their individual circumstances a number of things can happen. They can still be fined, although people found to be dependent are not. Professional licences can be revoked. But the main aim is to refer problem users to services and dissuade new users. Trafficking, supply and cultivation are still crimes and police/court resources are freed up to concentrate more heavily on these. The results by 2007 were an increase in cannabis use but drop in use of other drugs. Deaths from drugs dropped dramatically. The perceived increase in cannabis use might not be an effect of decriminalisation because it is in line with European trends. Italy and Spain, without decriminalisation have also experienced an increase. Or it might be an effect of decriminalisation simply because people are being more honest when self-reporting about their use - not because of increased use. The drop in deaths has a lot to do with heroin use and people now being able to get on substitution programmes (which NZ already has but are over-subscribed). Portugal had a big problem with HIV infection from shared needles. Apparently the law change is still controversial but in place at this time.